The client is an advanced sports analytics solution provider in the basketball industry, based in New York, US. Catering specifically to the NBA, international basketball teams, and U.S. College Leagues, the client provides game data, league statistics, and performance analysis to give international basketball teams a competitive edge. Their software tools provide vital information that enables professional basketball teams make peak roster, recruiting, and game strategy decisions. They work with Team Managers and coaches and provide unique insights into player characteristics, game performances, and other competitive advantages. 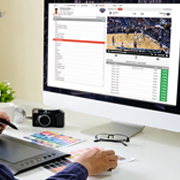 The client had a high-volume of basketball videos and required an outsourcing partner to study each video through a client provided interface. The outsourcing partner was required to identify the number of dribbles, baskets etc., of the overall team as well as specific players (as per client specifications), and note the precise time of each dribble, basket etc. The aim was to assist international basketball teams with accurate performance analysis statistics. Assigned resources had to gain an in-depth knowledge of the game of basketball and custom interface. On receiving the client's business enquiry, O2I assessed the clients' need, and scheduled a quality test (trial). During the trial, the client trained six O2I resources for two business days on the rules of basketball and the client's customized interface. On completion of the training, the client requested O2I's resources to tag two live videos through the custom interface. The resource watched the live video and noted every dribble, basket etc., and recorded it via a tick box on the interface. The automated interface noted the exact time of the dribble or basket. The resource also used client provided jersey numbers to track specific players and noted their dribbles, baskets etc. Based on the success of the trial, the client signed a full-time ongoing contract to outsource 100 videos monthly. O2I assigned six resources to handle the project and complete each video (one game) in five hours. On the completion of every international basketball game (in Europe), the client notifies O2I's resources to tag the live video via the interface. The O2I team works on weekends alone and delivers the final output on Monday morning (Central European Time). The client was pleased with the speed with which we deliver the ongoing project. They acknowledged the high cost savings they gained from our services (60 percent) and commended our accurate recordings. With O2I, you can outsource and work in your own time zone at the most affordable costs. Contact us today for precision tagging services, tell us your requirement and get a free quote within one business day.